This is a 12"x18" Poster signed by Chloe Grace Moretz. The autograph on this item has been signed upside down. This item has been fully examined by a James Spence Authentication (JSA) representative. This is a signed Funko Pop figure by Don Shanks. 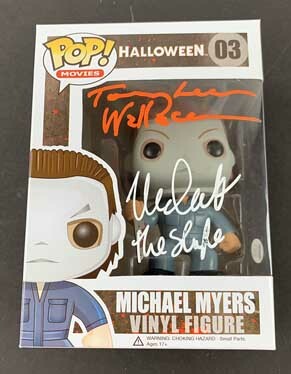 Shanks inscribed "Michael Myers" and "H5". There are some orange marks on the side of the box. This item has been witnessed by James Spence Authentication (JSA). This is a signed Funko Pop by Harry Manfredini. Harry inscribed the Music Notes on this item. The back of the box at the top has some bents on the item. This item has been witnessed by James Spence Authentication (JSA). This is a cast signed Jason mask. (2 of the signatures have damage to them) This item has been signed by Ari Lehman, Ken Kirzenger, Steve Dash, Kane Hodder, Tom Morga, Ted White, Derek Mears, and CJ Graham. Hodder inscribed "Jason 7,8,9,X". Dash inscribed "The Real Jason II". Ari inscribed "Jason 1". Morga inscribed "Jason V". Mears inscribed "Jason, F13th, 09". Kerzinger inscribed "Jason, F&J". White inscribed "Jason 4".Graham inscribed "Jason VI". This item comes with a Letter of Authenticity (LOA) from James Spence Authentication (JSA). This is a 8"x10" Photo signed by Linnea Quigley. Linnea incorrectly inscribed "Trash" on this item (She was "Trash" in Return of the Living Dead but this photo is from Night of the Demons). This item has been fully examined by a James Spence Authentication (JSA) representative. This is a "12x18" poster signed by Lloyd Kaufman. Kaufman inscribed "Toxic". The marker used on this item for the autograph did not come out nice and neat as depicted in the photo. There is a proof photo of Kaufman signing this item. This is a signed 12x18 poster by Rian Johnson. The autograph is smeared slightly. This item has been examined by Beckett Authentication (BAS). This is a signed custom full size helmet by Roger Staubach. There is black ink on the back of the helmet on the stripe. There is a also sticker residue near the the embelem of the Cowboys logo. This item has been examined by James Spence Authentication (JSA). This is a signed Funko Pop by Nick Castle and Tommy Lee Wallace. Castle inscribed "The Shape". The top of the box is bent on all four corners. This item has been witnessed by Beckett Authentication (BAS). This is a signed Funko Pop by Nick Castle and Tommy Lee Wallace. Castle inscribed "The Shape". The side of the box is bent and back of the box is bent. This item has been witnessed by Beckett Authentication (BAS). This is a signed Funko Pop by Nick Castle and Tommy Lee Wallace. Castle inscribed "The Shape". Castle's autograph on the item has black paint residue on it. This item has been witnessed by Beckett Authentication (BAS). This is a signed Funko Pop from Tony Moran. Moran inscribed "Michael Myers' and "H1". This item is bent at the back of the box. This item has been witnessed by James Spence Authentication (JSA). This a 16x20 Photo Professionally Framed & Matted signed by Zach Thomas and Jason Taylor. There is a white mark on the photo and some bends in the photo.